We thought we'd change our format a bit and give you a tournament chess news capsule every Sunday to keep track of ongoing chess events for the week. A small summary to tell you what's the leaderboard like in tournaments about to finish. Of course other regular news updated would follow as usual. On the 25th of October the first World Chess Games for Disabled (WCGD) began with their official opening ceremony in Dresden, Germany. With 35 players from 6 nations, some traveled from India and Spain, the WCGD gains international interest and experts call this world championship of all disabilities a forerunner that will influence the history of chess immensely. 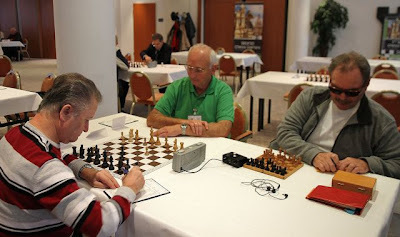 Participating in this tournament is a well known chess player: GM Thomas Luther. He is already seen as one of the top players of this tournament and holds a very special position: Luther was appointed as the official 'FIDE Adviser Chess for Disabled' at the last FIDE Congress. The participants have so far played 5 rounds for the title "World Champion of Chess Games for Disabled". You can access Fide for more details. The 11th Open Lucerne is taking place from 29th October to 1st November at the Hotel Anker in Lucerne (Switzerland). The 7-round Open is organized by the Chess Club Tribschen Lucerne. There are 57 players in Group A, rated for FIDE and SSB (Swiss federation), and 66 in Group B (U1900 ELO, rated only for SSB). Top rated players include Bindrich Falko GM 2548 Zittau GER, Hirneise Tobias IM 2446 Rommelshausen GER, Okhotnik Vladimir IM 2445 Uzgorod FRA, Krivonosov Oleg IM 2439 Daugavspils LAT, Belezky Alexander IM 2430 München UKR. You can access the official website at this link. The 32nd Edoardo Crespi Trophy is set to take place from 3rd to 11th December in the hall of Chess Club in Milan, via Sant’Uguzzone 8. Participation is open to all Italian and foreign players. All Italian and foreign players who are resident in Italy must show a valid FSI membership card for the current year or subscribe on site at the tournament venue, provided they apply for membership to the “Società Scacchistica Milanese” for the current year. The official website is here. The 15th International Bavarian Open Chess Championship is organized by the Municipality of Bad Wiessee and Tourism Tegernsee GmbH and takes place from 29th October to 6th November in Bad Wiessee am Tegernsee, Germany. The tournament will be played over nine rounds of Swiss system. The total prize fund is 16500 EUR. A number of young chess stars are taking participation, including the reigning World Junior Champion Dariusz Swiercz, Baku Open winner Sergei Zhigalko, Indian stars Parimarjan Negi and Adhiban Baskaran, Ukrainian wonder Illya Nyzhnyk and American on the European tour Aleksandr Lenderman. Check the official website here. That's neat. Hoped you would use more photos and give links for all news items. Thanks.